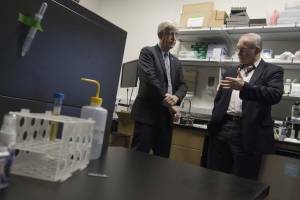 National Institutes of Health Director Francis Collins, M.D., Ph.D., spent a day at OHSU sprinkling some fairy dust of possibility that is spurring renewed optimism and new grant applications to fuel the next generation of science at OHSU. Dr. Collins visited on Monday, Oct. 24 to give the 2016 Mark O. Hatfield Lecture, named for his personal mentor, the late U.S. Senator Mark Hatfield. Dr. Collins’s standing-room-only evening lecture at CLSB – “Exceptional opportunities in biomedical research” – pulled together the narrative he built over the course of the day in small group sessions with faculty, partners, elected officials and students. It was a narrative about hope. After a dozen years of declining grant funding, the fever chart is inching up. 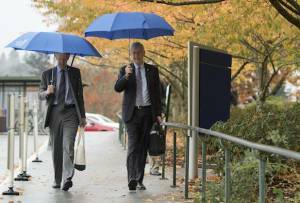 (Left to right) John Hunter, M.D., F.A.C.S., interim dean for the School of Medicine and National Institutes of Health Director Francis Collins, M.D., Ph.D. walk across the OHSU campus October 24, 2016. Dr. Collins met with OHSU leaders, learned about OHSU research and toured facilities prior to delivering the Mark O. Hatfield Lecture in the evening. The NIH’s BRAIN Initiative and the Cancer Moonshot, led by Vice President Joe Biden, are directing national focus to the frontier of basic science – the brain – and a scientific pursuit which now feels within reach: curing cancer. Failure to diversify the ranks of scientists has led to renewed determination, recognizing that attracting multiple perspectives to ask new questions and perceive new solutions is central to advancement. And NIH has launched the All of Us Research Program – with the goal of signing up 1 million people across age, race and class to fuel population health studies that can tailor treatments to individuals, rekindling patriotism of a nonpartisan nature akin to putting man on the moon. Yet the sense of possibility his visit engendered came not only from his marketing of NIH but in the ways he engaged faculty, partners and students and in the ways that OHSU used his visit as a catalyst. OHSU President Joe Robertson, M.D., M.B.A., and research leaders welcomed Dr. Collins with a luncheon discussion about the OHSU-Intel Cancer Cloud Collaborative. 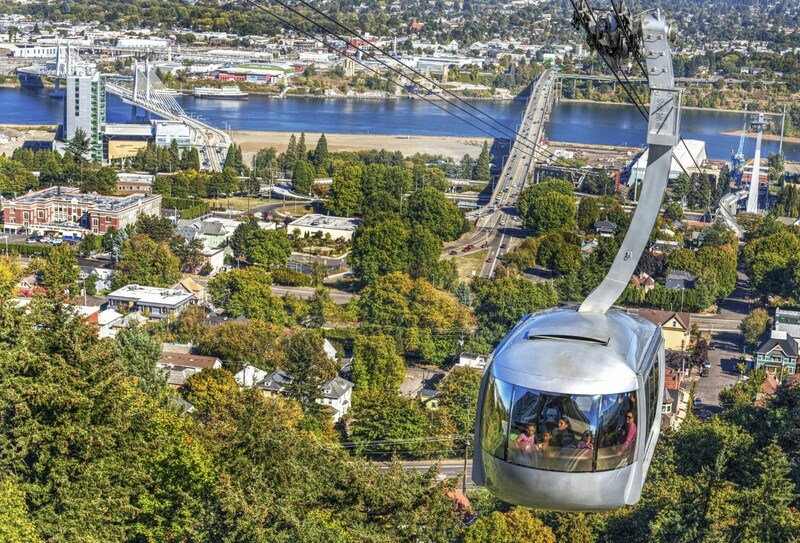 The conversation included OHSU School of Medicine faculty members Drs. Brian Druker, Joe Gray, Adam Margolin and Lisa Coussens;* U.S. Senator Ron Wyden and Rep. Earl Blumenauer; PSU’s Erin Flynn, board chair of Oregon Inc.; Intel leaders; and Eric Dishman, formerly of Intel and now leading the All of Us Research Program for NIH. Their discussion about a cloud of clouds — that allows researchers to bring their computers to the data rather than ginormous data sets to their computers — helped define for Dr. Collins how OHSU can contribute to the big data dilemma NIH must tackle to realize the promise of the All of Us precision medicine initiative. An hour-long research forum followed with teams from cancer, infectious disease and neuroscience presenting their work to Dr. Collins, who listened intently. “If Zika has been around for decades in Africa, why didn’t we know it had this impact during pregnancy?” Dr. Collins asked, sparking a discussion following a presentation on the virus by maternal-fetal medicine specialist Antonio Frias, M.D., associate professor of obstetrics and gynecology, OHSU School of Medicine. Bita Moghaddam, Ph.D., incoming chair of behavioral neuroscience, joins in a discussion with Dr. Collins during faculty presentations about research specialties at OHSU. And as Marc Freeman, Ph.D., director of the Vollum Institute, wrapped up his slides on OHSU’s work in neuroscience from bench to bedside, Dr. Collins probed how OHSU is positioning itself to take advantage of the NIH BRAIN Initiative. Minutes after the session ended, Damien Fair, Ph.D., P.A.-C., associate professor of behavioral neuroscience and imaging leader, and Bita Moghaddam, Ph.D., incoming chair of behavioral neuroscience, and Carsten Schultz, Ph.D., new chair of physiology and pharmacology, huddled in the foyer to plan a cross-campus collaboration on a grant application. 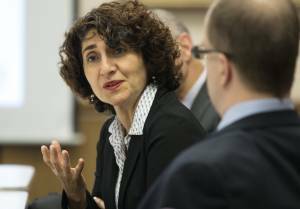 Dr. Fair said Dr. Collins’s visit seeded “a blossoming of ideas of all we can do across the institution” while also pointing out areas for improvement, such as the need for engineering expertise within OHSU – not just through tech partners – to meet new challenges in translational science. In a private session with 20 graduate students and postdoctoral fellows and during a question/answer period after his lecture, Dr. Collins delivered a chin-up message to trainees. He emphasized the areas where NIH is investing and offered thoughtful advice about staying flexible and choosing a research focus broad enough for a course correction if prospects in one area fizzle. National Institutes of Health Director Francis Collins, M.D., Ph.D. (left) talks with Joe W. Gray, Ph.D. at the Spatial Systems Biomedicine October 24, 2016. Dr. Collins met with OHSU leaders, learned about OHSU research and toured facilities prior to delivering the Mark O. Hatfield Lecture in the evening. Behavioral neuroscience graduate student Eileen Torres said Dr. Collins made her feel like NIH is in her corner, that the agency understands how the funding challenges impact budding scientists and has real plans for addressing the problem with strategic investment. Dr. Collins rounded out the afternoon before his lecture with a tour led by Dr. Gray of the OHSU Center for Spatial Systems Biomedicine, one of OHSU’s newest tools for taking science at OHSU to the next level. He ended the evening with goodwill.